THE CRAFT OF THE COCKTAIL is founded upon fresh thinking. Editor's Note: This image gallery has been adapted with permission from Humberto Marques' Herbs and Spices in the Cocktail Mixology study. He also has put together an extensive fruit pairing study and is an award-winning mixologist, currently working in Edinburgh, Scotland. This advice on mixing herbs and spices into drinks is invaluable for anyone who loves to experiment behind the bar. Tasting notes: The whole plant is aromatic. When rubbed, young stalks and leaves have a sweet, musky scent; the taste is musky and bittersweet, slightly earthy,and warm, with notes of celery, anise, and juniper. The flowers have a honeyed fragrance. Tasting Notes: Anise hyssop has a sweet, anise aroma and flavour; it has a natural sweetness, unlike many herbs that taste bitter when tasted alone. Tasting notes: Sweet basil has a complex sweet, spicy aroma with notes of clove and anise. The flavor is warm peppery and clove like with underlying mint and anise tones. 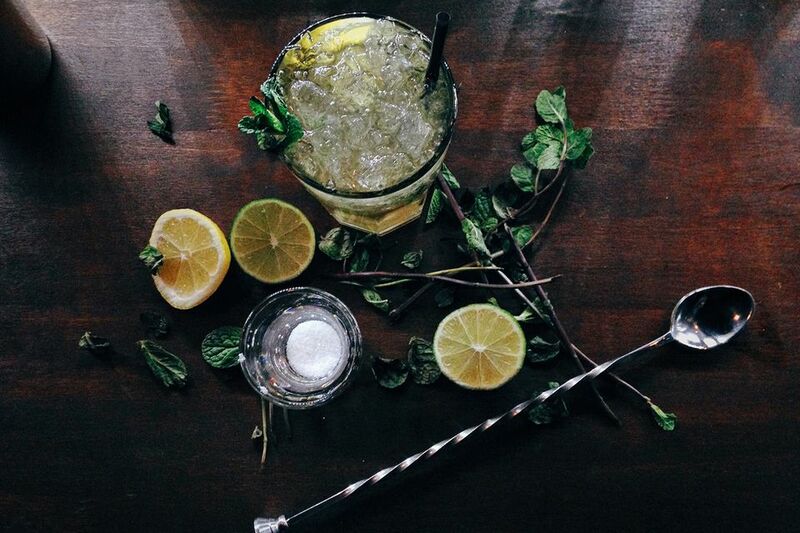 Shake all the ingredients with ice and strain into an ice-filled collins glass, garnish with basil. Tasting notes: The whole plant has a distinctive citrus aroma. The flavour is citrus with an added warm, spicy note. Flowers are more delicately flavoured than the leaves. In an ice filled cocktail shaker, add above ingredients. Tasting Notes: The aroma is strong but mellow, fruity, and penetrating. The taste is lemony and flowery, with notes of camphor or eucalyptus due to cineole in the essential oil; it is pungent and smoky, with a warm, bittersweet note, yet is also clean and fresh. Crush the cardamom and muddle with the rest of the ingredients, shake over ice and double strain into a cocktail glass. Tasting Notes: Cinnamon has a warm, agreeably sweet, woody aroma that is delicate yet intense; the taste is fragrant and warm with hints of clove and citrus. The presence of eugenol in the essential oil distinguishes cinnamon from cassia, giving it the note of clove. Could be used as a syrup (recipe for Cinnamon Simple Syrup). Notice that cinnamon is often used in warm cocktails or those with flavor profiles matching the tastes of autumn and winter. Tasting Notes: Leaves, roots, and unripe seeds all have the same aroma. Some people are addicted to its refreshing lemony-ginger aroma wit notes of sage; others hate it and find it soapy and disagreeable. The flavor is delicate yet complex, with a suggestion of pepper, mint, and lemon. Tasting Notes: Ripe seeds have a sweet, woody, spicy fragrance with peppery and floral notes; the taste is sweet, mellow, and warm with a clear hint of orange peel. Tasting Notes: Very aromatic when crushed young leaves. Leaves are pleasantly pungent flavour backed by strong notes of menthol and citrus. Also slightly sweet, tangy, and spicy with a fresh cool aftertaste. Leaves can be used to make infusions and syrups. Tasting Notes: Fresh ginger has a rich and warm aroma with a refreshing, woody note and sweet, citrus undertones. The flavour is hot, tangy, and has a bite. Rhizomes harvested young are milder and less fibrous than those harvested later in the season. Could be used as a syrup, or simply muddled. Tasting Notes: Leaves have an explosive fragrance, cleanly floral and citrus- not quite lemon, not quite lime. Their aroma and flavor are assertive and lingering, yet delicate. The rind of the fruit is slightly bitter with a strong citrus note. Dried leaves and dried rind lack the intense aroma of fresh. Tasting Notes: Lavender has a penetrating, sweetly floral, and spicy aroma with lemon and mint notes; the taste echoes the aroma with undertones of camphor and a touch of bitterness in the aftertaste. The flowers have the strongest fragrance, but leaves can also be used. Can be used as a syrup (recipe for Lavender Simple Syrup). Tasting Notes: Lemon Verbena as an intense, fresh lemon aroma. The taste echoes the aroma but is less strong; it is more lemony than a lemon, but lacks the tartness. The aroma of dried leaves is retained for up to a year. Tasting notes: The flavor is refreshingly tart, clean and citrus-like with peppery notes. Freeze-dried lemongrass keeps its aroma quite well, but air-dried lemon grass loses its volatile oils; grated lemon rind gives more flavor than dried lemongrass. Tasting Notes: Spearmint is mellow and refreshing, with a sweet sharp, pleasantly pungent flavour backed by hints of lemon. Peppermint has pronounced menthol notes and a fiery bite, yet is also slightly sweet, tangy, and spicy with a fresh cool aftertaste. Muddle the leaves with the syrup add the lime juice in a collins glass. Stir, add the rum and crushed ice. Stir again and add a splash of soda. Tasting notes: The seeds are fleshy and taste both sweet and acidic. Middle eastern pomegranates tend to be sweeter than those grown in India, which can have a slightly bitter aftertaste. The juice varies in color from a light pink to a deep red, it is sweet but with a refreshing sharpness. Tasting Notes: Strongly aromatic, warm and peppery, resinous and slightly bitter, with notes of pine and camphor. Nutmeg and camphor are present in the taste; the aftertaste is woody, balsamic, and astringent. The flavor dissipates after leaves are cut. Flowers have a milder flavor than leaves. Can be used as a syrup or just muddling the leaves. Shake over ice and pour into a collins glass and garnish with rosemary. Tasting Notes: The leaves are sweetly aromatic, with hints of pine, anise, or liquorice; the flavour is strong yet subtle, with spicy anise and basil notes and a sweetish aftertaste. A syrup can be made from tarragon, or the herb can be muddled. Tasting Notes: Fresh vanilla pods have no aroma or taste. After fermentation, they develop a rich, mellow, intensely perfumed aroma with hints of liquorice or tobacco matched by a delicate, sweetly fruity or creamy flavour. There may also be hints of raisin or prune, or smoky, spicy notes. Could be used as a syrup (recipe for Vanilla Simple Syrup).